I’m the youngest grandchild on both sides of my family. On my dad’s side, I was the eighth grandchild. You’d think this entitled me to loads of special treatment and doting. You’d be wrong (well, I did get special treatment and doting, but no more than the other grandkids). As the youngest (and smallest), I always felt a little insecure and out of place. I was never quite sure I belonged with the other grandkids even though I was only two years younger than one of my cousins. One day I discovered a family artifact that only exacerbated this feeling. It hung on the wall of my grandparents’ house and I’ll never forget the day I found it. I was young and exploring the house in the way only a small child can when I saw a handmade depiction of our family tree. The background was a simple painted tree with the usual cloud shape blobs of green representing its leaves. Nestled in the tree were glued on wooden cutouts of apples. Each apple had the name of a grandchild written on it. There were eight apples, but only seven of them were in the tree. My apple was away from on the others, on the ground. When I was younger it only added to my insecurity. I may have been included, but I wasn’t worthy of hanging with the other apples. Now, I’m sure whomever created the tree probably did so before I was born. My apple probably got added on after I came along so I wouldn’t feel left out. That would have worked if my apple was, you know, on the tree. If I could find that tree now, I could easily observe the comparative ages of the wooden apples and ascertain when mine might have been added. Why can’t I find it? The current location of that tree has been a mystery for years. And here’s the truly strange thing: most of my family still refuses to admit that tree exists and insists that my apple was not on the ground. My mother even has an alternate version of the tree where the apples are painted on instead of glued wooden cutouts. She claims it is the only tree. I am, of course, convinced that this tree was created later in some sort of revisionist history fashion to throw me off the scent of the original. So many of my family do not believe in the other version of the tree that I would doubt it myself, if not for two of my cousins, Kimberly and Stephanie. They both not only remember the real tree, but bring up my apple on the ground more than I do. Only they are brave, intelligent, and beautiful enough to speak the truth of the grounded apple (at least that’s what I tell the rest of my family). In fact, they apparently speak of it when I’m not even around. Month’s later at Curtis and Kimberly’s wedding, I met one of Stephanie’s and Kimberly’s relatives on their mother’s side (and I have no idea of what, if any, relation that makes her to me). She had an explanation for the apple on the ground. “You’re the youngest grandchild, right?” she asked. Even though that argument failed to sway me, something changed that night. I realized the placement of that apple has probably helped shape my perception of myself and my outlook on life more than I realized (or would care to admit). It might have been the wonderful wedding, or maybe the sheer fun of the reception, but something helped me move from mere acceptance of my apple on the ground. That night, I also embraced it. 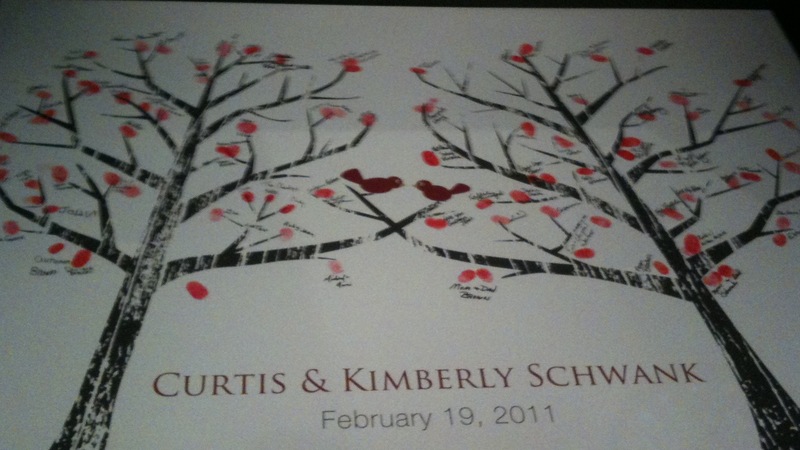 Kimberly and Curtis had one of the coolest things I have ever seen at a wedding reception. They had a large art print that resembled their invitations (which actually had wedding spelled correctly) laid out where everybody walked in. It has a simple white background with woodcut like black tress. 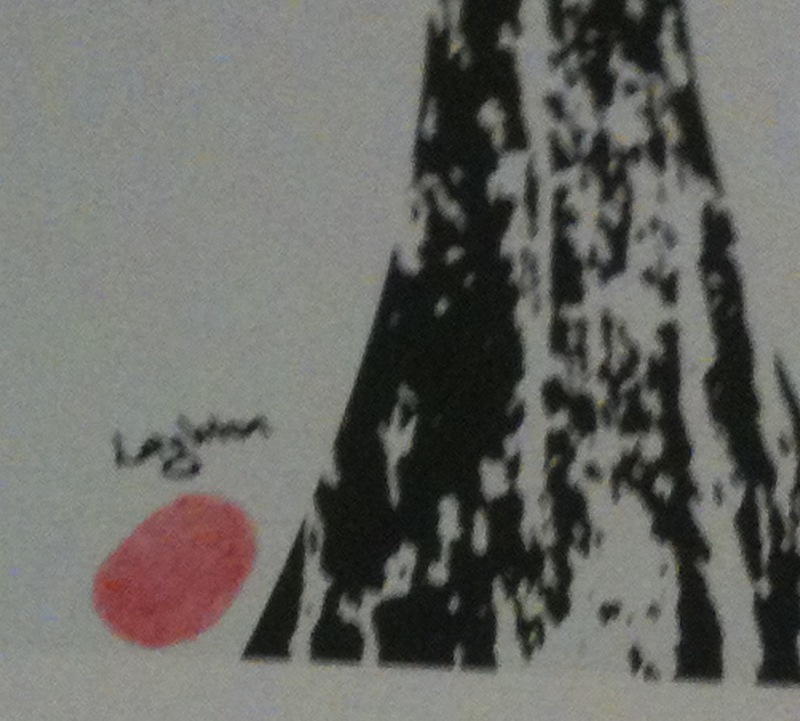 They had their guests place red ink on our fingers and then press them on the print to create the leaves of the trees. We were also supposed to sign our names beside our thumbprints. It created a stunning keepsake. I wish I had good ideas like this. I made sure I was one of the last to add my print to the piece. The leaves were well filled in when I got to it, but that didn’t bother me. I had something else in mind. I added my leaf in the most appropriate spot, close to the trunk of one tree and on the ground. Mine is the only one there and it gives me great joy when I think of it hanging on my cousin’s wall. See, I no longer think of myself as just an apple on the ground, but as the only apple on the ground. The trees can’t contain me and I’m not afraid to stand out where no one else dares. I’m willing to brave the ground while everyone sticks to the branches. It sounds pretty good, and maybe if I say it enough, I’ll convince myself and it will be true, just like how my family has convinced themselves my apple isn’t on the ground. At least three of us know better. This entry was posted in Stories and tagged Apple, family, family interactions, family relationships, family tree, just write, life lessons, postaweek2011, Tree. Bookmark the permalink.